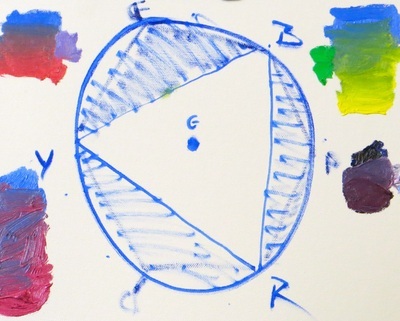 COMPLEMENTARY colors- opposites/ the color on the far side of the color wheel. Coolest color traditionally is blue; warmest is orange, HOWEVER, it's all relative. 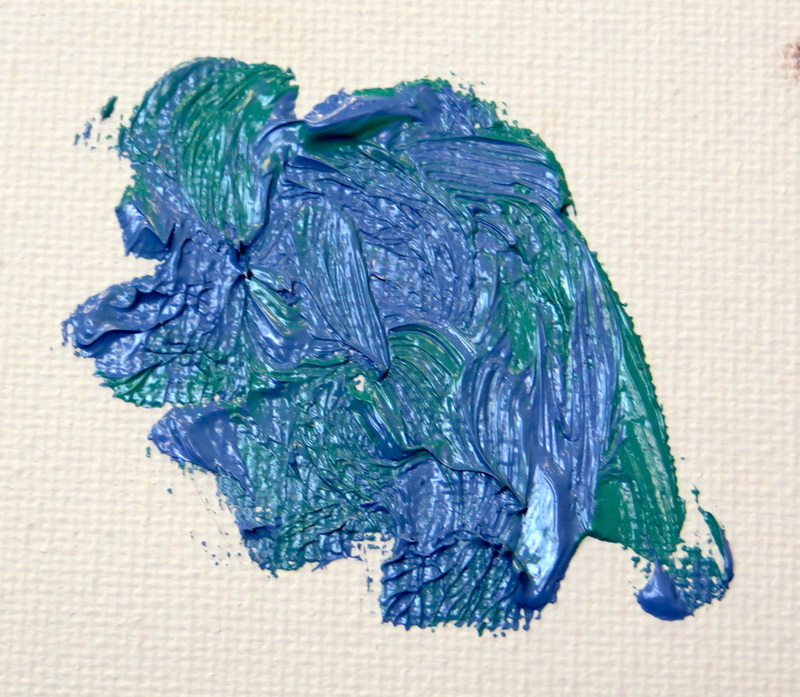 Utrecht brilliant blue (saturation - 10) mixed with Utrecht cadmium yellow lemon (sat. - 10) makes a green, however it is not a "brilliant" green because it is not a saturation 10. 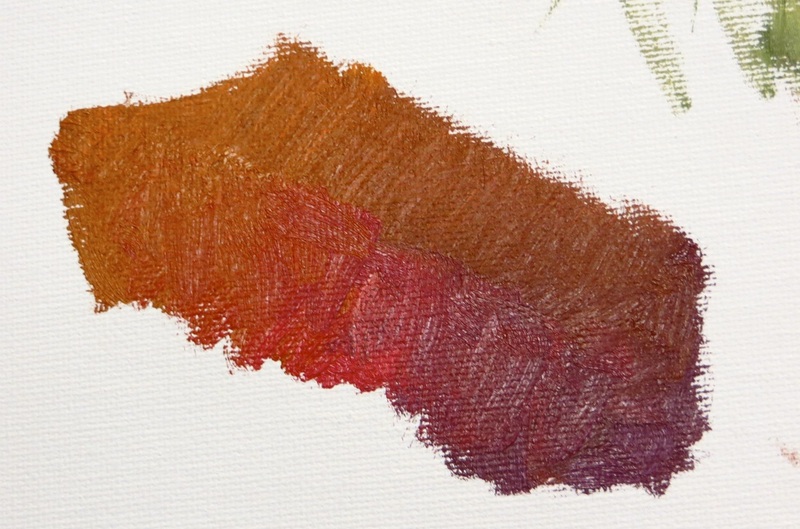 Cadmiums - saturation mixes down rapidly: hard to keep clean; cadmium red mixes as though it is orange (don't mix purple with the cadmium reds unless you want gray). We have two reds on the palette because cadmium red won't mix cleanly into purple: use alizarin red with purple. cadmium red will effect purple. Transparent colors- stain; they change a color but not a value. Opaque colors- the colors mex well; they change the value. *Tip* Paint brush handles are tapered at the end so we can hold several of them together in one hand without the brushes touching. 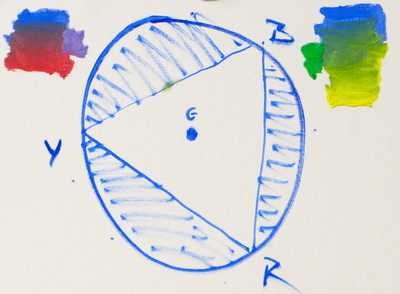 Clashing color/garish color - disharmonious; slightly wrong "note"; happens when mixing outside of the triangle. Example - mix brilliant blue and alizarin crimson to make a Purple. Target Mixing - most efficient way to get to a color; change FROM mixing a color into another color TO getting each color to the same value I want, then mix the two colors. 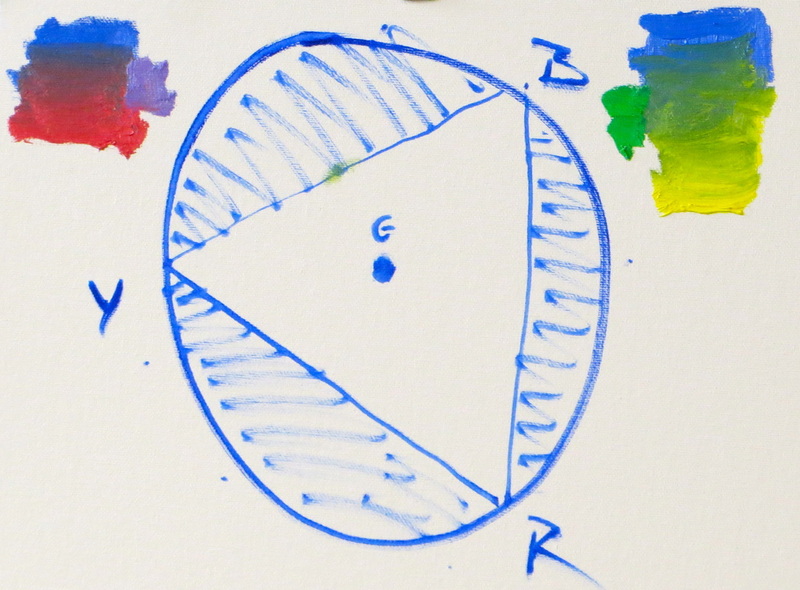 Optical Mixing - letting the eye mix the colors while the colors are separate on the surface. Optical mixing gives LUMINOSITY. VALUES are the key to successful optical mixing. From a distance, you will see the values; up close, you will see the individual colors. Making Gray - anything without 100% saturation has all three primaries in it. Green pile - take brilliant green and mix to the value I want by adding white: add some cadmium yellow medium. 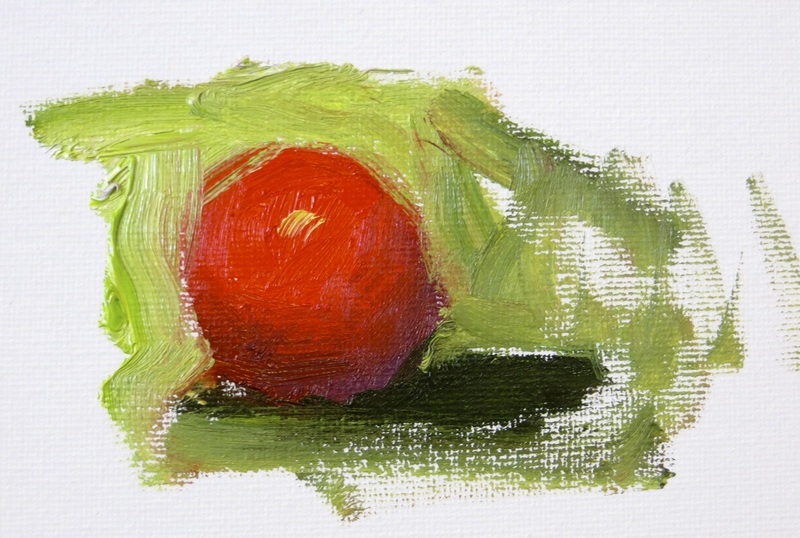 Orange pile - take cadmium orange and mix to matching value by adding white; add some cadmium yellow med. Purple pile - take dioxazine purple and mix to value by adding white. 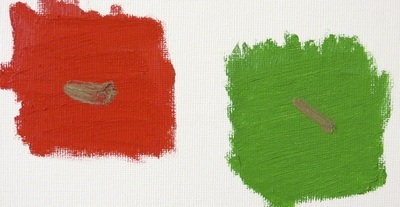 Test values with dots in each pile; pick up three colors on brush and apply strokes. Technique - Culling the brush - squeezing paint out of the brush while on the palette. *Tip* squint to see the shapes of values, not the actual values. 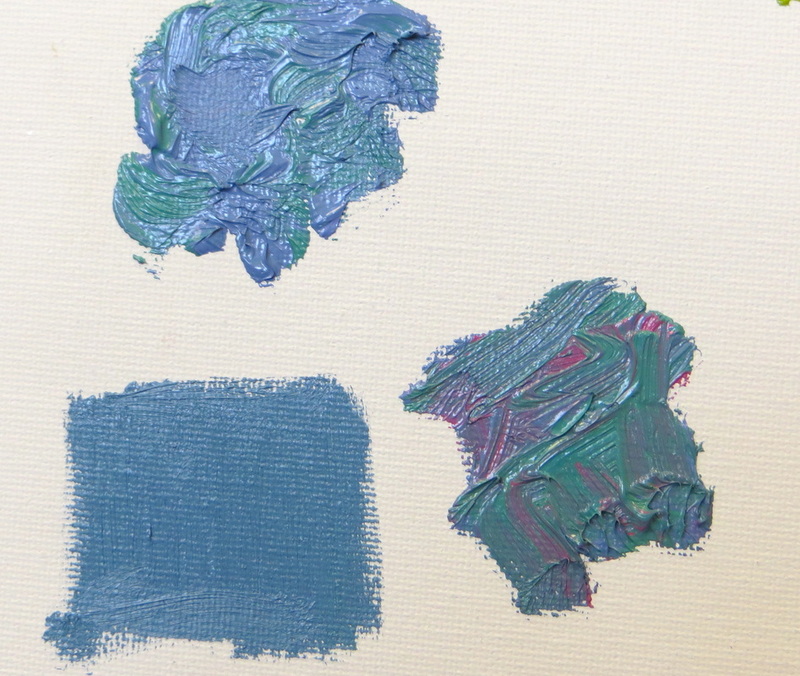 Vanishing edges - similar colors that are the same value (example: blue violet); most successful in lower saturation. Method #1 - two piles (red and green) to same value; bring together; makes a big dark gray stripe in center - DON'T DO THIS! "TRANSITIONS are what make the difference in a painting and a Masterpiece." We are now adding pure color in neutral parts moving through the painting. 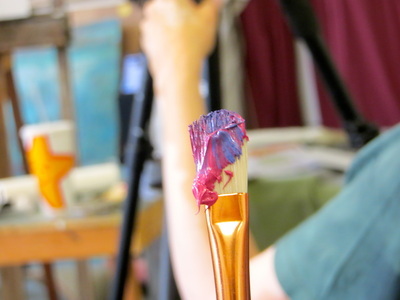 Add purple strokes; add yellow ochre strokes. The stroke assumes the properties of the larger mass of color (i.e. look at something that's lighter, you'll see it as lighter). The same is true for temperature. *Where the light hits the shadow is the greatest contrast of value; use as little white as possible to get the color you want; you want the higher saturation in the most lit area. We look for the color of the object where the light hits it, ask the local color is on the lit side. 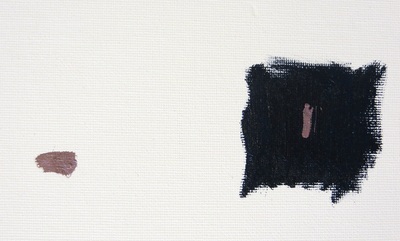 The shadow is secondary transitions of playful colors; you want to entertain the eye through that part of the painting. DEMO: go from purple to orange in one value change in the shadow. When you have more clean color in the shadow, the lit side stays away from chalky.